This free community event will provide businesses and organizations with simple solutions to make their websites accessible for individuals with disabilities. 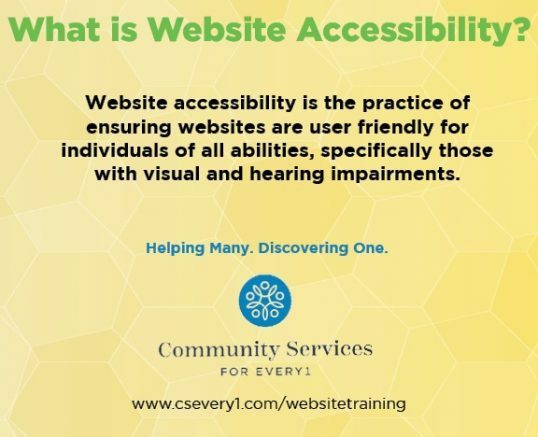 A free seminar on the topic of website accessibility for individuals with disabilities, presented by Jeff Surdej, owner of Surdej Web Solutions LLC of Lancaster, will take place at 10 a.m. Thursday, Feb. 28, at Community Services for Every1, 1845 Kenmore Ave., Buffalo. The event is sponsored by Community Services for Every1. Is your website accessible to everyone? This free community event will provide businesses and organizations with simple solutions to make their websites accessible for individuals with disabilities. Space is limited to 50 businesses and one spot per business. To register, please visit www.csevery1.com/websitetraining or contact Stephanie McGrath at 883-8888, ext. 144 or smcgrath@csevery1.com by Monday, Feb. 25. For more information on Surdej Web Solutions, please visit www.surdej.com. Be the first to comment on "Free seminar to cover website accessibility for individuals with disabilities"